Steyning Town Football Club boss Alan Skipper is hoping his side can mount a push for the Southern Combination League Premier Division next season. The Division 1 side struggled for consistency last term and could only muster a tenth-placed finish. For Skipper, it was his first role as a first-team manager and he felt it took a while to adjust. Despite a mid-table finish, Town’s boss believes with the addition of some new faces in the close season, they could be hunting promotion in less than a year. He said: “If we can attract three or four new players and keep most of last year’s squad, then we can really push for promotion. “We have some really attractive plans and will be working hard to make sure aims are achieved. Steyning have appointed Jason Pepperell to lead their reserve team next season. Over the course of the campaign last time out, Skipper called on several players from his second team and admits Pepperell has a big role to play to ensure the conveyor belt of talent continues. He added: “It’s such a positive appointment for us and we are really looking forward to working with Jason. “He will most certainly have a big impact on identifying players capable of stepping up from the reserves into my team. With league rules preventing players from signing for new clubs until July 1, Skipper admits there is not a lot he can do at present. 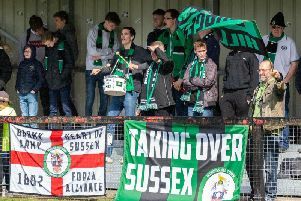 Despite this ruling, Steyning’s boss has been busy speaking to targets and trying to persuade them to join his promotion quest next season. Skipper said: “We have been looking at adding some further quality to the squad. “The team conducted themselves superbly but you always need and want to add some extra quality. “I have been in contact with a few players and some leads are looking promising. Skipper admits everyone is working hard in the close season to ensure he betters his first season in charge. Town’s boss believes the foundations laid in that year will also help him attract some talented younger players as well. He said: “A lot of people are working very hard here to make sure it is a place players want to come and play football.